There are many factors that impact pregnancy and birth that you should think about before you decide to conceive. To give your baby the best start and to have a healthy pregnancy, you should start acting like you are pregnant as soon as you decide to try to conceive so that you limit the risk of these factors that impact pregnancy and birth. One of the most important things you can do when you are trying to have a baby is quit smoking. Smoking is associated with about 10 percent of the infant deaths in America, and it is estimated that 13 percent of moms-to-be smoke during pregnancy. Smoking can also lead to other birth defects caused by the low weight of the baby. Outside of the womb, the risk of Sudden Infant Death Syndrome nearly doubles compared to babies who weren't exposed to smoke during pregnancy. They also have more risk of developing chronic coughs and asthma. If you breastfeed while smoking, milk production may be reduced and chemicals from the cigarettes will pass through your bloodstream and in to the baby, potentially making him or her sick. Another huge risk factor that impacts pregnancy and birth is alcohol use when trying to conceive and during pregnancy. Damage from alcohol use during pregnancy can happen even during the early weeks after conception and with only a moderate amount of alcohol. Alcohol consumption during pregnancy can also lead to low birth weight, organ problems, a smaller than normal brain, and problems with coordination. It is well known that obesity causes complications in pregnancy. Being severely overweight can cause conception problems and may reduce your fertility. When you do get pregnant, being overweight or obese can increase your risk of developing gestational diabetes, which puts stress on the baby and could cause him or her to gain too much weight in the womb. Other risks for overweight moms include preeclampsyia, which causes high blood pressure, swelling, and fluid retention and can decrease blood flow to the placenta. Women who are obese during pregnancy also have an increased chance of delivering through Caesarean section and a greater risk of developing infections after delivery. If your baby has health problems in the womb, it can be more difficult to monitor the situation because of excess fat. In addition to the baby gaining too much weight during pregnancy (a condition known as macrosoma), babies born to obese mothers are at increased risk for neural tube defects and for developing obesity themselves. If you are already pregnant, it is important not to try to lose weight since this is not the time to try a new diet or exercise routine. But if you are still thinking about getting pregnant, talk to your doctor about the risks and benefits of losing weight before you try to get pregnant. 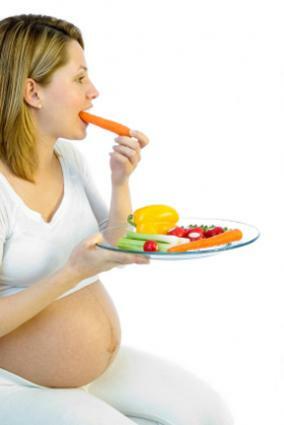 No matter your weight, you should be eating a healthy diet and taking prenatal vitamins as your doctor suggests. It is also a good idea to talk to your doctor about exercise during pregnancy, which should help you eliminate some of the risk factors that impact pregnancy and birth. Remember that the healthier you are when you get pregnant and the healthier you stay through your pregnancy, the healthier your baby will be and the fewer complications you will have through the process.